Our Charlotte office keeps growing, and we’re excited to have Ali Pugliese join us as an Intern Architect. 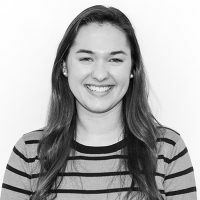 Originally from West Chester, Pennsylvania, she graduated from Penn State in May 2018 with a Bachelor of Architecture and a minor in Architectural History. While in college, she also co-founded a 3-D printing and design club called DigiDigits with a group of fellow Penn State architecture students to help children in need by creating more prosthetic-like training devices for children who have hand/arm malformations or disabilities. While not working, she enjoys traveling (9 countries and counting), cheering on the Philadelphia Eagles and Penn State Nittany Lions, and going to concerts. She recently made the move to North Carolina in November and is excited to begin her career with Cline Design Associates.